two hours has passed nothing but a series of bikers and a set of vehicles that passed by. rain came but the people have them their umbrellas and jackets while others chose to get wet instead. all for the final show of respect. we were watching the celebration of the Holy Mass at the Manila Cathedral yesterday over the television waiting for the best timing to go to the South Luzon Expressway to witness the funeral cortege. hours later we were on top of the overpass along the highway. people arrived in groups, streets filled with cars, but no sign of the cortege. people waited. rain and strong winds came but it made us even more determined to stay. i was with the Cruz family and my cousin. 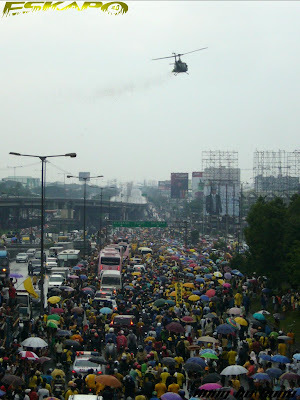 two hours came, they say it was still kilometers away but even more people came. there were children who for sure didn't know much about whose funeral they will witness but were there looking as determined. their parents surely wanted them to feel what they've fought years back. a historical inheritance. another hour came and we knew that the cortege was coming as choppers were now over us. police siren can be heard while flashing red and blue lights were in sight from afar. 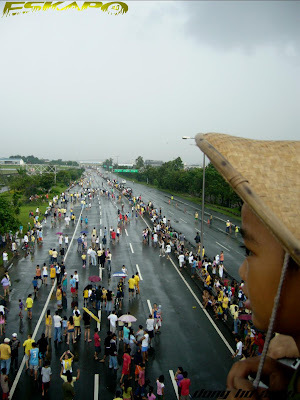 people were now crowding in the middle of the highway. seeing the people shouting "Cory! Cory!" and making the "L" sign was just overwhelming. 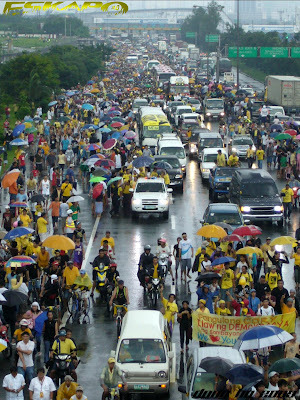 as the cortege passed by, we were just in awe seeing the huge crowd that went along with it. some crying, some empowered. choppers flying over throwing confetti and people were later waving good bye. 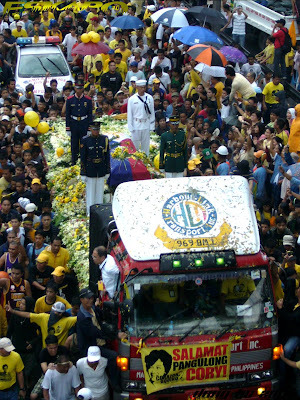 people were grieving but were as well strengthened. it reminds the people that we can as a nation, be united for something great. the Philippines will forever remember her role in the Philippine democracy. it was the people's fight, but the country needed someone to make that courageous stand. thank you Cory. thank you for loving the Philippines. 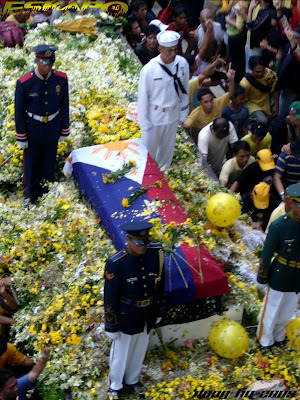 thank you for loving the Filipino people as Ninoy did. here's a video of her speech at US congress in 1986 as uploaded NinoyAquinoTV in youtube. Nice of you to get out. wow. kinilabutan ako....i got updates from my sis who was watching the covergae on tv while we were waiting along SUcat. 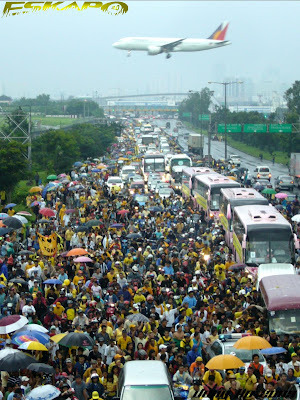 she said nga na ang daming tao sa slex. i didn't know ganito kadami. it's really overwhelming. nice shots dom. thanks for sharing. I wanted to see that in person. I've been tuning in too. 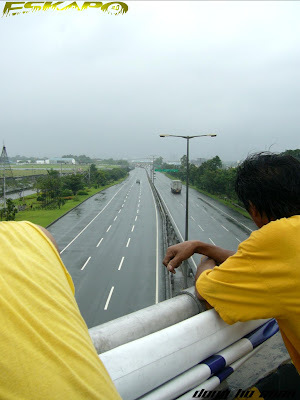 buti pards di nabasa yung camera mo...kung andyan din ako malamang mapasama rin ako..
nalaa ko dati nung nag work ako malapit sa edsa...wala kaming pasok nang tanghali kasi gumagawa kami ng tinapay para ibigaydati sa nag martsa nun nung kasagsagan ng people power! iba talaga ang isang cory aquino.. , a president we Filipinos could never forget.. how i wish andun ako..
i was so sure that meon akong ka-blogger na magccapture ng historic moment na toh.. sabi ko can't wait to see kung sino... and it was you!!! 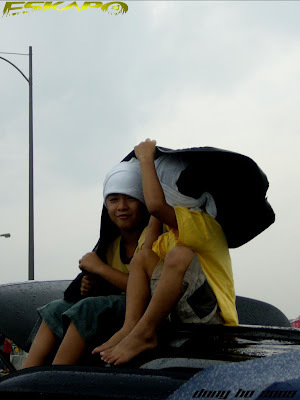 Lalo na sigurong maraming tao ang sisipot kung hindi umuulan. Talagang hanggang ngayon ay mahal ng bayan si Cory. She deserved the love, too. wow, you were there witnessing history? cool. nakatutok ako sa tv from 9am till midnight.. perfect shots with very nice caption/story behind..
yung video, nakakaproud talaga, ang galing ng speech niya. standing ovation for our president. ni-research ko nga full transcript ng speech na yun, nakaka-proud talaga. nice shots dong. how long did you have to wait? my tv was turned from early morning till evening. she will surely be missed. wow, you're part of the crowd. grabe yung 4 honor guards, di natinag for 8 hours! This is such a momentous event in our history! At ang ganda ng nakuha mong pwesto =) Great shots Dom! kuha mo sentimyento nating lahat. i would have gone there too if only i cud. she is such an important part of our history and will sorely be missed. truly, the mother of modern democracy. Excellent coverage. I must say excellent because considering the weather condition and thousands of people who were there waiting. it would be very difficult to cover such event. Very well done, donG hO! Even the sky is crying..
historical burial for a historical person..
how very lucky of you to be part of history, something you can proudly share to your children and grandchildren in the future. i stayed up all night till morning, eastern time, to watch cory's funeral. the least i could do was sign the condolence book at the philippine consulate in new york city recently. That is an incredibly touching tribute. God bless. Wow you capture the whole action well. You must have waited for many hours there. She is so well loved by her fellow citizen. i was really moved watching the said video.. and nice shots! i was born 1986, just a month before martial law. i grew up not really knowing what had happened back then. now on her death, i understand. correcting myself, just a month before the snap election. awts. 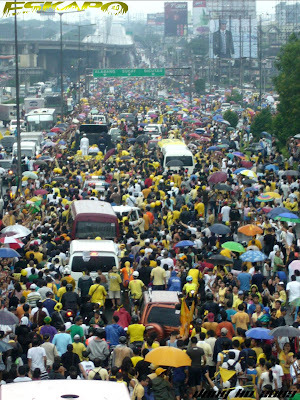 ganda ng shots kuya.. :) grabeng daming tao! 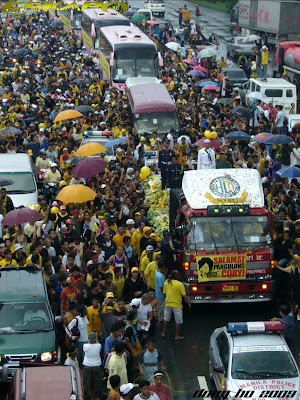 nako ang daming tao! that only show kung gaano ka importante si cory sa bawat isang pinoy na tulad ko at tulad mo!